Hot dog sausage in a soft bun with a sachet of tomato ketchup and mustard. Let's be frank. A good hot dog smothered with sauce is ace. No two ways about it. 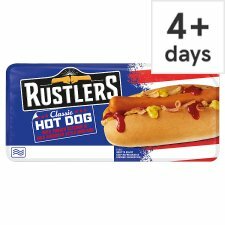 The Classic Rustlers Hot Dog comes with a sachet of tomato sauce and a sachet of mustard. Knock yourself out with extras by piling on as many different condiments as humanly possible. A nice spicy chilli and a good handful of grated cheese melted over the top always works well. If you have any comments, give us a shout and let us know! Remember to keep the packaging in case we ask for it. Remove from packaging, stick in the microwave and heat on full power. Squeeze over the ketchup and mustard, then enjoy!